In order to assist you, the blogging community, in the selection of fine candy for your Autumn and Halloween pleasure, I hereby present the official results of the great Hershey's Kiss taste test, as performed by my children and tabulated by me. Single-blind trial, prepared by me. Subjects were given unwrapped kisses coded by letter, and instructed to silently answer three questions for each. Choice of milk or water was provided to cleanse the palate between tastings. Flavor 1-5; 1 being barfy, 5 being "mom please buy lots of these"
What do you think the name of this flavor is? Name guesses: "basic kiss" "caramel chocolate" and "caramel-filled chocolate jumbo kisses"
Comments: "I think the middle tastes different. It is sort of creamier." "It's delicious and I love the middle." My thoughts: I can't believe Jungle Boy thought this was a regular kiss. And he hates caramel usually, but loved these. Go figure. Name guesses: "Candy corn (2)" "Halloween kiss"
Comments: "It's delicious and I love the flavor." "I think they are good but they would be really good for Halloween." My thoughts: Waxy, but definite candy corn taste. Fun. Name guesses: "Cinnamon" "Peanut caramel kiss" "Cinnamon cream"
Comments: It's really yummy and it gives a feel of Christmas." "These are ok but I might like them some times more than others." My thoughts: I love these, but I can see why the kids aren't crazy about them. Perfect for Thanksgiving. Name guesses: "Pez candy" "Milk chocolate kiss" "Strawberry filling"
Comments: "I love how it's sweet like candy but at the same time chocolatly" " I think they are a little sweet but they are good for the holidays." My thoughts: I was expecting cough-syrup flavor, but they're actually pretty good. Definitely very sweet though, as the kids said. Probably perfect for SAHM's who sit around all day watching soap operas. Name guesses: "Dark Chocolate" "Hot chocolate"
Comments: "Even though they are simple with nothing special, but I think they are great." "Delicious." My thoughts: Not as rich as some dark chocolates. Good though. Name guesses: "White chocolate" "White and dark chocolate swirl" "zebra stripes and cow poop in the middle"
Comments: "Sooooo good" "It was kind of bland for me but I wouldn't mind if other people like it." My thoughts: Not my favorite. Name guesses: "Almonds (2)" "Marshmallows and nuts"
Comments: "Yummy to the tummy" "I think it was really smart to put an almond and I like it." My thoughts: fun to watch Drama Girl make a face and spit it out. I guess you have to like almonds. Name guesses: "Chocolate kiss" "Dark Chocolate" "Awful" (I think Drama Girl had had enough chocolate at this point). Comments: " I think they were good, and these are probably the cheapest because they are so plain but good." "I love it." My thoughts: The original and still the best. So there you are, with the final word on each type of Hershey's kiss. I know that you, the demanding candy consumer, will probably print this out for your next candy purchase expedition. Some people can rate wines, but how many people can rate Hershey's kisses? And for the record, that little piece of paper in every kiss? It's called a niggly-wiggly. Now you know. Oh honey, I need to send you some good, honest chocolate from the UK/Europe. Then you'll wonder what you were thinking by putting that stuff in your mouth! *lol* And this, coming from someone who absolutely HATES HATES HATES chocolate...except for two days out of the month. But those two days it had better be imported otherwise it gags me. And hey, aren't those nasty little candy corns bad enough already? 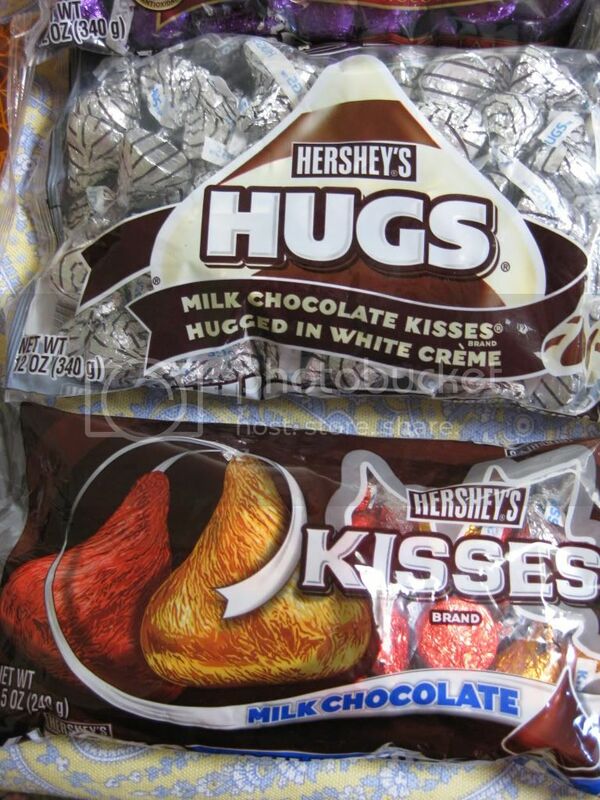 Why did Hershey's have to go and make them WORSE? FWIW...eldest daughter loves the cherry cordial kisses. 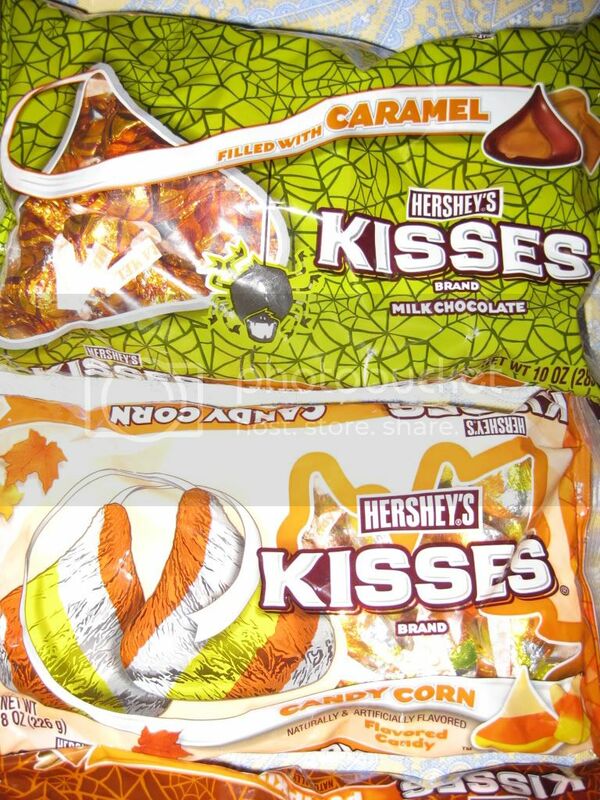 Oh, I had no idea they had candy corn kisses. Imagine that. I will have to pass, I hate candy corn on its own. They are pretty however! I think the carmel filled ones would be devine. That's quite an experiment you ran there! I love the little baggies. Oh, I miss candy kisses. Stupid nut allergies! PS~~You're the best mom ever. 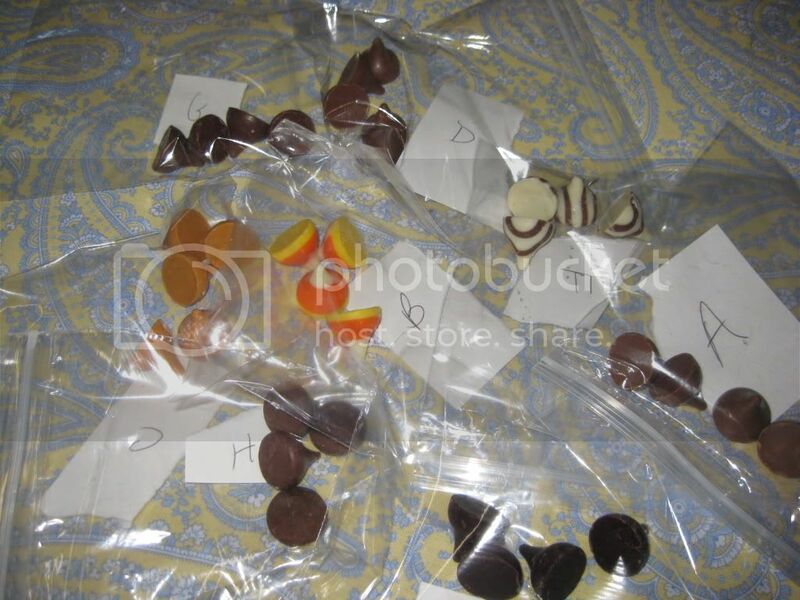 I don't ever do anything cool like let my kids taste test chocolate! you HAVE enriched my world today. Thank you for your service. I'm partial to the caramel ones. I cannot buy caramel Kisses because I cannot be trusted alone with them. I have moderation issues. Let me summarize your findings: they are all good! I have to agree on Hugs though. I've always thought they were bland. And I do think that part of the appeal of Kisses is the nostalgia. Not the best chocolate but the chocolate I remember from childhood. Oh, and is Cheryl trying to up her game with comments so she can be ABOVE me on your comment list? I never choose candy corn to buy but if I am eating it. I cannot stop. PS. Cheryl is NOT going to beat me. I like caramel more than chocolate these days. I love that you let your kids have sugar. My kids would love me if I had them taste test chocolate. Maybe I should try that closer to Halloween- when its close enough that there is less chance I will eat all the candy before the trick-or-treaters. I agree with auds, though, the imported chocolate is MUCH better. Dove does a good job though. This is a very helpful post. I love the caramel ones and bake them into cookies! Love them. Oh this is awesome love it! This was wonderfully helpful. Thank you. If I knew how to give blog awards, I would give you one for being the big sister I always wish I had. I have a big sister, but I tend to have to take that role and wish she would fulfill her proper duties. Oh, and I am going to ignore the SAHM comment because I 'know' you well enough now to know you were joking.